It's no secret, I'm deeply in love with everything Matilda Jane... love the cheeky clothes, love the people who create all the yumminess, love how they spread the love in many ways. They truly have hearts of gold. And this holiday season, lucky me gets to be a little Matilda Jane elf... and YOU just might become one too!! The winner gets to keep one of the dresses for their own darling and then spread the happiness even more by gifting the other two to little cuties in need of a some holiday cheer. 1. Simply sign up for Matilda Jane's newsletter. The link will bring you to the right place =). 2. Come back here and tell me one of your fondest childhood holiday memories. 3. Smile at everybody you come across for an entire day =D!!! Spread the love, give happiness!! Ok, so this really isn't part of the contest requirements... but try it anyways ;-). Winner will be announced on December 8th here on my blog! Winner will receive 3 dresses in different sizes. Winner picks 1 dress to keep (in their child’s size, or closest to their child’s size or just the one they like best) and get to give the other 2 away to whomever they please. Matilda Jane or Monika McSweeney Photography will not be taking any requests for size or style and dresses are non-refundable or exchangeable. Good luck!! Can't wait to read your childhood holiday memories =)! My favorite childhood holiday memory would have to be growing up on Christmas Tree Lane. It was a few blocks of houses that decorated the outside of each house for Christmas. People would come from all around to see all the lights. We would have one resident dress up as Santa and hand out candy canes to kids. It was so fun and magical to see this happen every year. My favorite Christmas memory is from when I was about 10 years old. My family and I had just moved to a new city in a different state and we didn't have alot of money at the time. I remember I got a charm bracelet and a New Kids on the Block doll, and a real rabbit. I LOVED that Christmas, I had no idea that my parents had gotten the rabbit for free and that they were struggling. As I got older and told my parents how that has always been my favorite Christmas, my Mom started crying because she remembers that Christmas completely different. She remembers feeling bad that we weren't with family that year because of the move, and she felt terrible about our gifts that year. But I think it just proves that it doesn't matter what you get on Christmas, as long as you are loved. My favorite memory was every year we had a special visit from Santa at our house (and all the other kids in our neighborhood as well) about a week or 2 before Christmas. He would come in the evening while we were awake just to check up on how we were doing and he would bring one small gift then we got to tell him other things we wanted. It wasn't until my grandmother passed away and we were cleaning out her attic that I found the Santa costume and my dad finally confessed that it was him that dressed up every year for all the kids. That was also my daughter's first Christmas so my dad donned the outfit one more time while they were visiting us for the holidays so that Santa could make a special visit for her too. I still can't believe I NEVER realized it was him!! My favorite childhood memory is of my family cutting down our annual Christmas tree every year. I grew up in Wisconsin so it was cold, bitter cold...but my mom would pack a thermos of hot cocoa and pop fresh popcorn and off to the woods we'd go. I would Always feel sorry for the distorted looking trees and would convince my family that we needed to "save them" and give them love in our home for the holidays since nobody else would pick them. Great memories. When I was in 6th grade it seems that all of my moms side of the family became spread out accross the US while my grandparents stayed in IN. In 11th grade over Christmas break each one of my aunts and uncles with all my cousins went to Nana's house in IN. There were so many people and we truly had the best time. I dont even remember about presents or anything I just remember feeling so much love and happiness just thinnking about it brings a smile to my face. My favorite childhood memory was going to my grandma's house every year for Christmas Eve. They would cook all kinds of traditional Norwegian food. I had the best Christmas ever when I was 6 (or at least this is what I was told). The summer before I had just mastered riding a bike without my training wheels, but the bike was way too small. I was hoping that Santa would bring me a pink bike with a banana seat and a basket. Little did I know I had the bike plus Super Woman Underoos (my next best love) under the tree Christmas morning. I was so excited I literally blanked out. My mom says that I put on the Underoos in the middle of the living room (in front of multiple relatives) and took my bike outside to ride up and down the driveway in 40 degree weather. I didn't realize what I was doing until the chill in the air got to me and I noticed I was riding around outside in glorified undies. My favorite childhood memory was getting to open one present on Christmas Eve with all the anticipation of more to come the next morning. We'd drink hot cocoa, sing carols, and generally have a great time. MY favorite childhood memory would be riding bikes with my friends all over the neighborhood. It was a different adventure every day and we’d stay outside until our parents called us in for dinnertime (via shouting our names) we would be so hungary after a long day of play, and sleep like a rock! FUN! I want to do a blog giveaway! Okay... my favorite Christmas memory was when my baby sister was born! I was thrilled with my Barbies and super cool Barbie house, but really all day long I was watching my mom to see if she was going to go into labor! As the fun Christmas events were winding down and family had left... my mom told me it was time! I ran up to the apartment up stairs to get my grandma, and we rushed to the hospital. Two hours later, just 5 minutes before midnight... my baby sister was born! I was no longer alone! I had a sister to be my very best friend for forever and ever! My very best Christmas present EVER! Oh gosh this is wonderful, I love this idea and I know of two friends who could use some MJ happiness this holiday season. My most fond holiday memory would be a plastic train set we had in our foyer that was only set out around Christmas. I loved setting it up with my brother and sister each year and I played with it every day. It didn't make sounds, it didn't have any lights and I think it just went in a circle but I sure loved that train. My favorite Christmas memory is one that happens every year....picking out our tree.....I would get giddy and I always took the job very serious. Mom and I would go and I would walk around and look at every tree before picking out the perfect one!!!! The pride I felt when it was all lit up and in our home. Now as a mom, I've passed the job down to Lilly Kate and it melts my heart to see that she takes the job just as serious as I did. My favorite childhood memory was of making Christmas cookies at my Grandma's house. She helped us roll out the dough and we got to decorate the cookies with sprinkles and cute them into any shape we want. I can't wait to pass this on with my own children! One of my fondest Christmas memories was every year at my grandma's house, Santa would visit. All of the cousins would barely touch their dinner in anticipation of hearing the jingle bells ringing on her door. We thought we were the luckiest children getting a personal visit from Santa on Christmas Eve. It took years for us to figure out it was my grandpa on the opposite side of the family that visited us! One of my favorite childhood memories is going around town looking at all the Christmas lights! The city where I grew up has tons of "holiday lanes" with different names and themes. Two of my favorite were Candy Cane Lane and Churchill Lane. I looked forward to this all year long! There were about 5 lanes when I was young and now there are over 30. Each neighborhood goes all out to decorate in the chosen theme. Fireplace Lane has real fireplaces in the front yards! Now I look forward to taking my daughter. We even booked a limo tour this year to make sure we saw them all in style complete with cookies and hot cider! My fondest childhood Christmas memories were of the holidays when we lived in Germany and Italy. I loved learning and celebrating the different traditions of other countries and sharing ours with our German and Italian friends. I love Matilda Jane. Seriously they do the neatest giveaways. 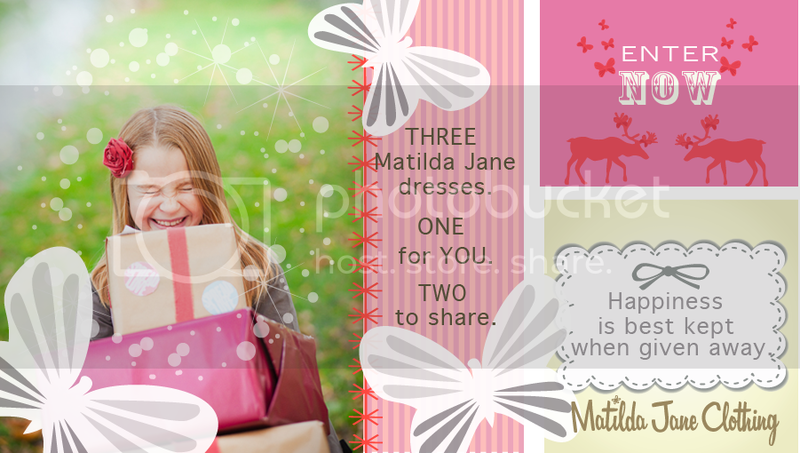 Not only do you get a gift but you get to give away Matilda Jane dresses too.. Sooo neat. Well I have to say that the Christmas that sticks out to me the most is the one when I was 10. Our parents didn't have alot of money at the time, so they prepared us ahead of time that we each would get something small.but you can imagine what it was like Christmas morning when we woke up and found that our older brother(he was 11)had picked out some of his favorite toys and wrapped them up for me and my sister. He wanted to make sure we had a great Christmas, and we did. It was by far the best Christmas I had growing up. I love my brother he taught me alot that year. My whole family used to go to my Grand Aunty's house for Christmas eve and at midnight Santa would come. I remember thinking we were the luckiest kids in the world because he would come see us first before going to deliver toys to all the other children! My favorite holiday memory is when I was 9 years old - my brother (my only sibling) was born on Christmas day! Best gift ever. I just squealed when I read this! Oh my goodness, I am so excited! I know just the two little girls I would spread the love to! Their mommy told me today they didn't have the money to buy presents this year. My favorite Christmas memory is a little bittersweet. My grandma was able to come up for Christmas in 1999. We had a regular Christmas, not knowing that two weeks later she would pass away. I am so thankful for the time I was able to spend with her. We have to cherish every moment. You just never have any guarantees in life. Thanks so much for the fun giveaway :) One of my favorite childhood memories was with my grandpa. We would play board games or cards and eat a bag of christmas m&m's together. Still amazing that I can remember that after 25 years. He has passed away since but still remains in my heart forever. We would go visit my grandparents in Europe and my Grandpas only request for us to bring for the Holidays was M&M's :) Thanks for spreading the love! Love this idea for a giveaway!! One of my favorite moments was finally be able to get a Christmas Tree for our house. I wasn't allowed to have one ever (long story) and my mom let me get one and ohhh how I loved decorating that tree. I still have some of the ornaments and love watching my lil girl put them up on our tree every year. Thanks Monika and Matilda Jane! posted Anon cuz my Google account needs to be fixed! This is such a fun giveaway!! My fondest Childhood memory is when I was 9 doing the 12 days of Christmas for my grandma. She was paralyzed on one side and in a wheelchair, and she would get soooo excited telling us about the random people leaving such amazing things on her doorstep. She never knew it was us but was always sooo happy and I loved seeing her smile even if it was only one side of her face :) she passed away feb two years later, so I will be forever grateful for those memories of her! Thanks for doing this!! Fondest childhood memory would be any year during childhood decorating the Christmas tree with my mother, father and younger sister. We had one big tree in the living room and smaller trees in our bedrooms, breakfast room, family room, you name it! We really got into decorating for Christmas and I cannot wait to instill that into my family, too! I grew up surrounded by acres and acres of woods. We would put out Christmas "treats" for the critters. I would love to see all their footprints in the snow on Christmas morning, and most of the treats gone! I loved getting together as a family when i was younger for the holidays. we would sing songs and i would pretend i knew how to play on the piano by pounding on it throughout the entire song. My favorite memories as a child would have to be about going to my grandparents for the holidays and everybody came and spent the whole day there. Everybody got along.Now that my grandma has passed we dont get together anymore. We always spent Christmas with Granny and Granddaddy. I would sleep in the back room of the house with Granny. I clearly remember looking out the window with the moon shining and hearing noises that I absolutely knew were reindeer landing on the roof. I was so excited I woke up my Grandmother. My grandmother loved Mounds candy bars. Every year on Christmas morning she would be the first one up. We would come downstairs to find Grandma with her stocking dumped out on the floor and her Mounds bar already half eaten. Every year! My fondest memories were when we were younger and my grandpa Julien would dress up as Santa(we didn't know it was him), and come into our house on Christmas Eve. We would sit on his lap and tell him all the things we wanted for Christmas. I always asked my dad if I could see the reindeer, he said they are up on the roof, and it is too cold to go outside. My favorite childhood memory of Christmas is receiving a dollhouse. That year had the biggest wow factor when my brother and I went downstairs by the tree Christmas morning. I saw a dollhouse that was painted to look like my actual house and my brother got a train set that year. It was amazing! I still have the dollhouse and plan to pass it on to my daughter when she is older. My favorite childhood memory was Christmas in Hawaii. My dad was stationed at Hickam AFB and I loved playing outside in warm weather and shorts with all my friends. Most of us wer away from extendeded family so we didn't have to travel around to see family. We got to just hang with all our friends. It was just my mom and I growing up, & I was always so excited for Christmas. Thanksgiving night we would put up the tree and decorate with colored lights, the red & silver garland, and ornaments I made. Then we would decorate it with popcorn on a string and listen to the record of Sesame Street Christmas. I will cherish those memories forever! I grew up in a very impoverished family, toys were a luxery. Usually for Christmas, I would recieve Goodwill clothes, Dollar store fodder or cheap candy purchased with food stamps (the real paper kind) so my mother could collect the change to pay bills. I do remember one year being in a Salvation Army clothing store to get our annual donation of clothes (bell bottom courderoys? YAY!). I saw a beat up Milinium Falcon on the shelf. it was out of box, missing pieces, but it was so COOL. I begged my mom for it, but she said we couldn't afford it (yes, we were THAT poor). I wasn't heart broken, just sad. Even at that age I could understand that clothes and food were more important. Christmas morning, I awoke to find a Sunday Comics wrapped Milinium Falcon. My mother had apparently asked the employee to hold onto it and she would send one of my brothers to get it later. I would live to win a dress for ava's friend- her daddy up and left one day- and a few weeks later she was diagnosed with jeuvenille diabetes. She has been fitted with an insulin pump now- but things are hard for her all around- her big sister (4th grader)has been so depressed about her little sister. We were using the the youngest jonas brother as an example of how kids can live with diabetes. She came to a show I had awhile back and loved all the skirts- but they just can't afford it. Monika you better believe I'll be smiling at everybody all day!! My fondest childhood holiday memories are getting a tray of homemade cookies every year from our grandma. She made tons of different kinds and me and my sister would get the tray home and eat that whole thing that night. My belly hurts just thinking about it! My favorite holiday memory is Christmas Eve. 16 aunts and uncles and 22 cousins all crowded in to my grandparents house to laugh, play games and eat until we couldn't eat anymore. We opened presents and then headed out to church with everyone. It was so much fun being together and celebrating Christmas. For as long as I could remember my mother dressed up with us every year for Halloween. We walked through town house to house without being afraid of people out to hurt us laughing and eating our candy before we could get home. However Christmas is my favorite holiday and every morning before my parents woke, we was able to have our stockings full of goodies.What a great feeling it was to stare at that wonderful tree so bright and those presents checking each one for rips in the paper! My favorite childhood memory is of my Dad tucking me in at night. He would take the time to talk with me about my day and tell me stories about his childhood. It was always our quiet time to talk. He was the best! Memories of being young and my whole family staying at my grandparents house. The adults would stay up late playing Rook and my sister and I would be too excited to fall asleep. We would get up so early and open presents and then have a huge breakfast together. Most have passed away so I will always cherish those memories! One of my fondest childhood memories at Christmas time was seeing Santa's footprints in the morning. My dad used to dip a pair of boots into ashes in the fireplace and then make footprints over to the tree and around the house. We loved it as kids. Christmas is, by far, my favorite time of the year. I have SO many amazing memories, but the best would have to be the year I woke up to find hoof prints in the snow on our porch. #1 - it snowed on Christmas day. That doesn't always happen in TN #2 - did I mention HOOF prints? I just thought that the reindeer had enjoyed the food my sister and I had left for them. On the porch there was a letter telling me that Santa had to get the reindeer hitched back to the sleigh because they were having too much fun running around and playing with my new pony. Yes, I got a wonderful pony that year for Christmas! We lived in the country with lots of other great animals and my pony was very special to me and my sister for many years. Best Christmas EVER! One of my favorite Christmas memories was about 6 years ago. We had 4 extra tickets to Legoland and we decided to pick someone randomly at the gate to give them away to. I told my oldest that he could choose the family that we were going to give the tickets to. It took him forever. I was beginning to lose hope that he would ever pick anyone. But he pointed to a family finally and said, "Mom. That's them." So we went up to this family of 4 and offered them the tickets. The Mom and daughter start crying and I was confused until the mom regained her composure to tell me that their oldest child (a 13 year old girl) had died from cancer 1 month prior. They left their home state for the holidays and came to California to try to get away from the painful memories of being home. It really left an impression on myself and my kids about the frailty of life and to count our blessings every day. I think about that family every single Christmas. It is a reminder to me of how important family is and that really, when it comes down to it...nothing in the world is more important than the people we love. my favorite childhood memory of christmas is wrapped up in my grandparents. i loved the big italian feast they would prepare every christmas eve. i really miss those days. I love lighting our old menorah and placing it in the window and watching the candles burn down slowly. I would sit there with a book watching them burn down. I loved going to Christmas Eve church service with my parents. We always ended the service by singing Silent Night and everybody had their own candle to hold. I knew that I was growing up when I was allowed to hold my own candle! My favorite childhood memories involve my maternal grandparents. We celebrated Christmas Eve with them every year they always made it so special. They were truly child oriented people. Christmas was always about heir three grandchildren. Since they have passed away it just hasnt been the same, I miss them dearly. I try to pass on their love for the holidays to my own children even though they never met. My dad was in the military so we lived in Germany for a time. I remember playing with the hedgehogs that lived in the back yard of the complex. They were so cute. I didn't know what they were at the time. We had lots of boxes from moving so much and I made the hedgehogs a house & nursery. Thank you for the chance to get and give! My favorite is all the baking we would do! My mom loved to bake and we were always baking something, Russian tea cakes, candy cane cookies, sugar cookies, peanut brittle, hard rock candy and so many others. We would put together tins of the goodies to pass out to friends and family. Now, I love to bake with my daughter and continue the tradition! My favorite memories are all of the Christmas Eves my entire family spent at Grandpa & Grandma's house. I had so much fun with all of my cousins every year! My favourite memory was the year that my cousins came over for Christmas morning to open presents with us. I was 7 or 8, and absolutely idolized them and was in heaven playing with them all day. They even snuck us out of the house for an "errand" and took us for ice cream before dinner. Looking back, I am shocked a bunch of teenagers wanted to hang out with kid me. I need to thank them for that. One of them has become one of my best friends in the past few years, and I love dropping everything to do things like that for her daughter. She is my world! about 25 of my family members went Christmas caroling on Christmas Ever..we knocked on strangers houses and sang Christmas carols. Talk about the magic of Christmas...it was such a special night. My fondest childhood memories was getting ready for pictures in front of the tree. On Christmas eve we would get to open one present and it was a new outfit that we got to wear for our pictures. It was such a special treat for us growing up because we wore uniforms to school. I always couldn't wait to see what I got to wear that day! My favorite childhood memory is one that continues year after year. I love the last night of channukah when all the candles are lit on the menorah. I like to sit there and watch until the last one flickers its last little flame. My fondest childhood holiday memory was reading 'Twas The Night Before Christmas on Christmas Eve before bed, with my Mom & Dad. As the youngest of five, I was always the first awake on Christmas morning. I would run into my older brothers' rooms and drag them out of bed to go see what Santa had left for us. My fondest memories about Christmas was sitting at the base of our family Christmas tree (which I still have!) and comparing just how different my sister and I were. She would rip into each of her packages finishing way before I was half way through, as I would meticulously remove each piece of tape and unfold the wrapping off of each present! My parents would laugh at us and they could nearly reuse all of my wrapping! I grew up in a single parent home with two older brothers and one older sister. My mom was the best and was bust taking care of four kids while putting herself through college. Needless to say, money was tight. The funny thing is, we never knew we were poor because my mom worked so hard to make sure that we still got to do fun things. I remember one rainy Saturday my mom told us to go upstairs for a while and she would have a surprise when we came back down. It seemed like AGES that we sat up on the top step waiting for her to be finished. Finally, she came up the stairs wearing an apron, a bow tie, and a neon visor on her head. She then proceeded to pull out four envelopes, one for each of us. Inside of the envelope was monopoly money. She led us down the stairs and into the hall going into the living room. Here she had a ticket booth set up for us to buy our ticket to the movie. After giving us out “ticket stubs”, she walked behind the buffet table and laid out a large assortment of candies, popcorn and drinks and we were able to use the rest of our money on snacks for the movie. We then watched not one but two movies and had a great time just hanging out with family. I know this doesn’t seem like that splendid of a time, but looking back on it I can see how wonderful my mother truly was. I will always cherish this memory and be thankful for the many memories and adventures my mom has given me. My favorite memory is sitting around on Christmas Eve waiting to open presents. We had our "favorite spots" to sit and we spent HOURS watching each other and spending time together. I love my family and treasure all those times together! My favorite Holiday memory/tradition is hands down hearing my Dad, the strong silent type, read the book "Quintillius" to us. This is a little known book about the star who shone over Jesus' birth. He read it to us every Christmas Eve growing up, and know a Grandad to 7, he reads it to ALL of us! I so look forward to that and have captured it on video a few times to relive it for years and years to come! My favorite holiday memory is sneaking down the back stairs with my little sister in the early morning hours to just sit on the couch and look at the evidence that Santa had been there. It was magical for us :) Then we would quietly sneak back upstairs, crawl in our beds and pretend that we hadn't seen a thing. Well my favorite memory is that every year my mom would make my sister and I matching pajamas to wear on Christmas Eve. We would wear them to bed and to open gifts on Christmas morning. We looked forward every year to our pi's. And now that we are both married and have children of our own, my Mom continues the tradition with our kids!!!! I look forward to Christmas Eve when the kids get their matching pajamas to wear!!! My favorite memory is picking a family in need every year and secretly leaving a pile of presents on their doorstep the evening before Christmas. I will never forget how incredible that felt as a child and I am so excited to keep the tradition alive with my 3 little girls! Signed up for newsletter! Favorite memory - my Dad picking me up to put the angel on the tree. My sisters and I took turns each year, and it was such a big deal when it was my turn!!! I am signed up for the Matilda Jane newsletter. As far as favorite memories go. . . going to visit my grandparents for Christmas dinner. They lived in a small mobile home, and it would get really cramped, but it was cozy and fun to get to play with my cousins who I didn't get to see much. I signed up for the newsletter. And my favorite childhood memory is when my 3 siblings and I would stay up when we were suppose to be sleeping and would have such a fun time laughing and playing games. Then, if we got caught we would just stop, drop, and pretend to sleep. It worked..i guess. One of my fondest childhood memories was driving home from grandma's house Christmas Eve night searching in the sky for Rudolphs red nose. I swear you can trick yourself into seeing it! My favorite childhood memories involve my cousin and I making up dances to songs...thinking they were super cool and performing for our families!!! :) I wish we had video taped them! I think one of my favorite things to do was look through the hundreds of Christmas cards my parents always get... hours of entertainment right there! My favorite thing was always going to my grandparents house and running around with my 7 cousins playing with all our new toys. One of my favorite childhood holiday memories is our tree walk. A group of family friends used to always go to the tree farm to choose our Christmas trees. We came up with a traveling party concept to see them all decorated at each house. We'd have treats and drinks at each place, ooh and ahh over their tree, take the family's picture in front of their tree, and then it was on to the next house. So much fun! I signed up!! !I had cancer when I was ten and had to go through chemotherapy...my parents were not very well off and I did not think they could afford a wig, so I never asked. Then they surprised me on Christmas with a wig so I would not have to go to school with no hair!! My favorite childhood Christmas memory is that of our entire family getting together on Christmas Eve. We would all draw names and give gifts to one another after a big family meal together. Family is so important to me and I enjoy watching my children take part in this age old tradition each year. I am all signed up for the MJC newsletter. My fondest holiday childhood memory was just getting together with all my aunts/uncles/cousins/friends. A houseful of people filled with laughs and good food. Seeing people that we never saw during the year, but could count on seeing each Christmas. I signed up for the newsletter. Fondest memory: Waking up Christmas morning to a jungle gym in my backyard. Something I had always dreamed of but never expected! My favorite Holiday memory is always going to my great grandmothers house on Christmas Eve. oh I love your photos! SO many fond childhood holiday memories - my favorite - snuggling with the fam sipping on hot cocoa in front of our fake fireplace listening to ol' Christmas classics! 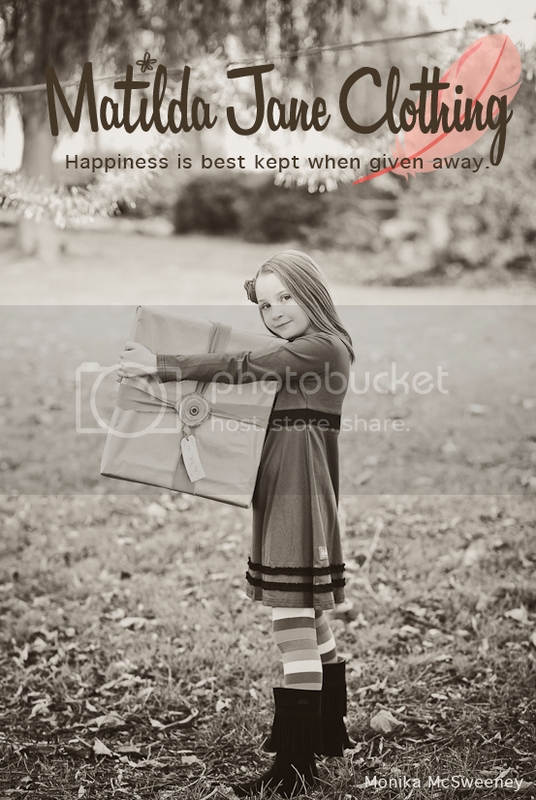 Thanks for this great reminder of cherishing moments and for a great giveaway! One of my favorite memories is going to Chicago for the day every year and then going to the big FAO Schwarz - my parents would let us each pick out a new toy. I'm signed up for their newsletter, thanks! My fondest memory is going to my aunts house each Christmas Eve for fried chicken, pizza, and french fries. I loved looking at my aunt's village and hearing stories about her and my mom and my uncle. I signed up for the Matilda Jane Newsletter! We love MJ! My favorite memories of my childhood are having my sweet little Grammie pick me and my sister up from school and taking us to lunch! She was awesome! She loved us so very much! A spunky little Granny who loved eating gumdrops and Eskimo pies, watching football and hockey and ice skating, and spending time with us! Boy were we lucky! Still miss her to this day but I am so thankful that my mom and dad are equally fun and involved grandparents. My kids will have some amazing memories too! Okay, I smiled at EVERYONE today and it felt darn good! I realized that I must make a point to do this more often even when I am busy and stressed! Hi! I've been smiling at the only two people I've seen for the last 7 days! Bed rest is so boring! lol My favorite holiday memory ... shew, that's a tough one! I think it would have to be first grade ... I'm sitting with my big brother on Christmas Eve, opening one gift per tradition, and we look out the window to see this tiny red light blinking and moving through the sky. We were convinced it was Rudolph. I remember jumping up and down with him, and then running off to bed to make sure we were asleep before he got there! We both remember hearing this thump from above, somewhere in a daze. It was pretty amazing. I receive the mjc newsletter! one of my favorite memories is a tradition my grandparents started years ago--we stroll their neighborhood streets a few days before Christmas and carol to all their neighbors. My grandpa passed away two years ago and I am looking forward to taking my children caroling this year to honor his fun and caring legacy! I am signed up for the newsletter. My fondest childhood Christmas memories are packing up the carrier on top of our car and driving to Tennessee from Indiana to spend Christmas with my grandparents. yes, there were a few times we only got so far, before snow turned us around. My grandpa used to somehow sneak out of the house on Christmas eve and shake some bells, then say he was pretty sure santa had come. We would then go downstairs and see piles of presents! Not sure how a single man pulled that off!! One of the best grandpas ever. my fondest memories of spending time with my cousins. we had/have so much fun together. Missing my Grandparents as they made the BEST Christmases! Presents would explode all over the living room. So amazing! Our family would go to a Christmas Eve Candlelight service and then we would come home and open one present before we went to bed that evening. When we woke up in the morning, Santa had visited and left all kinds of unwrapped goodies in front of the tree. Love Christmas! Going to my Great grandmothers house downtown Indy and seeing all the lights and decorations. The department stores were decorated beautifully back then!!! My most fond memories are all those Christmas mornings when I lie awake waiting for someone else to wake up and just dreaming of what Santa might have brought for me.I still get butterflies for my three children Christmas morning. When we were little my parents would put up a giant sheet over the door way to our family room where the Christmas tree was. I can remember waking up and having to stand and yell for our parents because their bedroom was off the family room and amazingly enough we never peeked (they must have scared us enough not to peek!) After we woke them up they would come into the kitchen, and make us eat our breakfast and then open our stocking, all before getting to see what Santa had left for us! It sounds silly but it made Christmas morning so fun. I can remember even when my brother and I were in college us asking Mom and Dad to put up the sheet and getting mad when they said no! Growing up, it was just my sister, mom and I. My mom worked 2 jobs to support us and often worked Christmas and took her lunch break at 9am to come home and open presents with us. But Christmas Eve was always special. We'd always go out for dinner and I loved looking forward to it and the excitement of Christmas being so close. Now, every Christmas Eve, my DH's and my family gather together for appetizers - and I know my own kids look forward to that night. My parents would load up four kids and travel from Knoxville, TN to Milwaukee, WI to be there on Christmas day. My mom would pack the van with everything we would ever need and then put a mattress on top of all the packed stuff. We would all sleep and make up fun games. One of my favorite childhood memories is spending the day with my family in NYC. My parents took my brothers and I to see The Christmas Spectacular at Radio City. I remember being in awe of the Rockettes. my best childhood memory was sitting around the christmas tree while my grandpa would play silly songs on his guitar until our faces and belly's hurt so bad from laughing!!!!!! My favorite childhood memory is the year it snowed so much we missed 3 weeks of school. I was in the second grade and I built a snow fort in our backyard with my sister and 2 brothers. It was so large it took a full week to build and then we played there for 2 more weeks before school started again. My favorite childhood memory is of our family "Dallas" nights. My mom would make the hidden valley ranch sour cream dip mix and grab some regular ruffles potatoe chips and carrot sticks to eat it with and we would sit around the coffee table for an hour munching on yummy snacks and watching a show that I hardly understood. I just liked the swimming pool and horses in it and thought Sue Ellen and Pamela were so pretty. And what a treat if mom and dad let us stay up a few minutes later and watch Simon and Simon. I loved those nights. Simple, inexpensive, yet so memorable. I enjoyed us all being together. Going to my grandparents house on Christmas Eve & we would get to open one present. Which would usually be Pj's & then my grandpa would gather all the kids and throw money in the air for us to get! My favorite childhood Christmas memory was the year that the whole family, giggly girl cousins and all, was over celebrating on Christmas Eve. The excitement was in the air for sure. My mom had made sure there was a red light bulb for our porch light, that was the "signal" for Santa to stop at the "Good Kids" houses (a little fact I soon had forgotten about). I remember standing on my tippy toes, straining my neck and stretching and trying so hard to see out the little glass windows near the top of the old wooden door. I had no concept of what time of eve it was, but I knew bedtime was soon approaching as the evening with family was winding down. I so badly wanted to catch a quick glimpse of Santa before heading off to bed! No Santa just yet, but I did see the "red glow" of Rudolph's shiny nose...I nearly fainted with excitement, squealed with delight, and ran down the hall so fast to my bedroom to sleep. I had the hardest time falling to sleep because my heart was about to beat out of my chest! Oh, no! Santa nearly caught me peeking when I should've been in bed already plus I was beyond thrilled to actually be that close to Santa himself and his team of reindeers! I swear to this day that I heard jingle bells. I woke the next morning much to my relief to a lovely stocking filled with goodies, my favorite part of Christmas morn. I BELIEVED! My favorite childhood Christmas memory is going to my Aunt's home for Christmas Eve. Caroling around the piano and Santa magically appearing with gift for us every year. My favorite childhood memory at christmas time is learning how to make fudge with my Nanny (gramdmother). One of my favorite memories as a kid was receiving my most dreamed of gift - a dollhouse. In a rush of the excitement of christmas morning (fueled by cinnamon buns and adrenaline) I opened the box and expected a house to come out of it. When it was just a bunch of pieces i was crushed (I was actually quite sure it had gotten broken in a tragic santa/sleigh transit accident) but soon learned that it was one you put together yourself. Me, my mom, my dad and my brother spent all day christmas gluing intricate roof tiles and wall trim to a pretty victorian dollhouse.